In addition to our constant attention to impeccable aesthetic detail, Beautiful Orchids' experienced designers will evaluate the available lighting and environmental conditions in your home or business, and create breath-taking, one-of-a-kind arrangements to suit any space. Beautiful Orchids creates our arrangements from a variety of elements: exotic branches, lush mosses, collectable containers, and of course, the most beautiful of orchids. To maintain the health, beauty and longevity of your arrangement, we provide a weekly watering service by orchid professionals, which includes the care of your additional indoor plants. 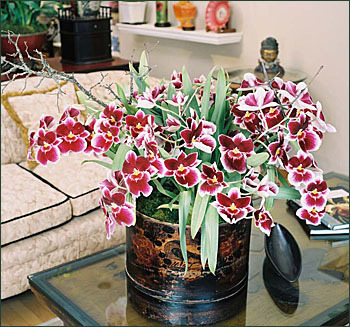 When looking for the perfect gift or party centerpiece, choose from the living works of art in our exquisite showroom; or, bring in containers from your own collection and our in-house designers will arrange them with just the right orchids. Bring in photos or fabric swatches, and let our designers help match them with arrangements you can bring home and enjoy that day. We can also special order rare and exotic orchids for your collection. San Francisco Bay Area pick-up, delivery, and nationwide shipping available.